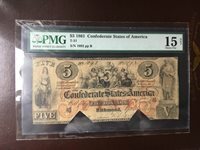 T-31 PF-1 $5 Confederate Paper Money 1861 - PMG Choice Fine 15 Net! Confederate States $100 Note (#1276) 9/18/62 Train. Nice Note. Few Pinholes.